Polyploidy and phenotypic evolution in Brassica. The genus Brassica(cabbage, broccoli, cauliflower, canola) is a fascinating model for plant domestication because of its spectacular variation in vegetative forms and dynamic chromosomal behavior. Using a phylogenetically informed approach, we are dissecting the reticulate evolutionary history of Brassica. 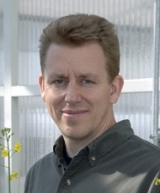 In addition to looking at natural polyploids, I am part of an NSF Plant Genome Group that is studying synthetic polyploids to understand the mechanisms that can give rise to novel phenotypes (http://polyploid.agronomy.wisc.edu/). Recently, we found that resynthesized Brassica napus allopolyploids rapidly evolved heritable differences in flowering time. A chromosomal rearrangement of a genomic segment containing a flowering time gene was responsible for 29% of the phenotypic variation among the Brassicapolyploids. We are following up on this experiment by "replaying the evolutionary tape" to find out if 50 resynthesized polyploid Brassicalines are similar to each other and to natural polyploids. To date, it appears that chromosomal rearrangements and epigenetic events may play a major and previously unsuspected role in the generation of new phenotypes in polyploids. Witnessing the interplay between immediate epigenetic changes and long-term functional gene divergence should provide data to advance our theoretical understanding of the relationship between genome duplication and gene expression. Integrating phylogenetic theory and genomic approaches will allow us to investigate the dynamics of polyploid evolution. In the figure above, Brassica napus allopolyploids (middle) are resynthesized by crossing rapid cycling, self-compatible doubled haploid lines of B. oleracea (left) and B. rapa (right) followed by colchicine treatment. The allopolyploids have novel phenotypes (e.g., hybrid vigor) in comparison to their diploid progenitors. The diploids are actually ancient polyploids, making Brassica a model system for studying layers of genome duplication. Phylogeny and chromosomal evolution in the Asparagales. As part of an international collaboration, we have completed large-scale phylogenetic analyses of the monocot order Asparagales (Brodiaea, onions, agaves, irises, orchids). This work has integrated classical and modern approaches to plant systematics, and based on molecular and morphological data we now know that Brodiaea is not directly related to Alliumbut is instead more closely related to Hyacinths and Agaves. These and other surprising phylogenetic results have led to revised taxonomic classifications of monocots and give us new hypotheses for examining the morphological diversity, historical biogeography, and wide range of genome size and chromosome number of the monocots. To further address these issues, we are utilizing resources being developed for model crop species (e.g., Allium, Asparagus, Oryza) to analyze genomes in related organisms (e.g., Brodiaea, irises, orchids). Such studies will synergistically examine the evolution of nuclear genes and chromosomes across the Asparagales and the monocots. Unraveling the complex relationships between genotype and phenotype is one of the most long-standing and intriguing challenges in evolutionary biology. Confronting these broad enduring questions would facilitate the synthesis of diverse approaches to the study of plant evolution. Zou J, Fu D, Gong H, Qian W, Xia W, Pires JC, Li R, Long Y, Mason AS, Yang TJ, Lim YP, Park BS, Meng J. De novo genetic variation associated with retrotransposon activation, genomic rearrangements and trait variation in a recombinant inbred line population of Brassica napus derived from interspecific hybridization with Brassica rapa. Plant Journal, . Article in Press. Zuccolo A, Bowers JE, Estill JC, Xiong Z, Luo M, Sebastian A, Goicoechea JL, Collura K, Yu Y, Jiao Y, Duarte J, Tang H, Ayyampalayam S, Rounsley S, Kudrna D, Paterson AH, Pires JC, Chanderbali A, Soltis DE, Chamala S, Barbazuk B, Soltis PS, Albert VA, Ma H, Mandoli D, Banks J, Carlson JE, Tomkins J, dePamphilis CW, Wing RA, Leebens-Mack J. A physical map for the Amborella trichopoda genome sheds light on the evolution of angiosperm genome structure. Genome Biology 2011;12(5), art. no. R48. Xiong Z, Gaeta RT, Pires JC. Homoeologous shuffling and chromosome compensation maintain genome balance in resynthesized allopolyploid Brassica napus. Proceedings of the National Academy of Sciences of the United States of America 2011;108(19):7908-7913. Bekaert M, Edger PP, Pires JC, Conant GC. Two-phase resolution of polyploidy in the Arabidopsis metabolic network gives rise to relative and absolute dosage constraints. Plant Cell 2011;23(5):1719-1728. Mayfield D, Chen ZJ, Pires JC. Epigenetic regulation of flowering time in polyploids. Current Opinion in Plant Biology 2011;14(2):174-178. Roxanne Steele P, Pires JC. Biodiversity assessment: State-of-the-art techniques in phylogenomics and species identification. American Journal of Botany 2011;98 (3), pp. 415-425. Raven PH, Chase JM, Pires JC. Introduction to special issue on biodiversity. American Journal of Botany 2011;98(3):333-335. Navabi ZK, Stead KE, Pires JC, Xiong Z, Sharpe AG, Parkin IAP, Rahman MH, Good AG. Analysis of B-genome chromosome introgression in interspecific hybrids of Brassica napus x B. carinata. Genetics 2011;187(3):659-673. Xiong Z, Pires JC. Karyotype and identification of all homoeologous chromosomes of allopolyploid Brassica napus and its diploid progenitors. Genetics 2011;187(1):37-49. Givnish TJ, Ames M, McNeal JR, McKain MR, Steele PR, Depamphilis CW, Graham SW, Pires JC, Stevenson DW, Zomlefer WB, Briggs BG, Duvall MR, Moore MJ, Heaney JM, Soltis DE, Soltis PS, Thiele K, Leebens-Mack JH. Assembling the tree of the monocotyledons: Plastome sequence phylogeny and evolution of Poales. Annals of the Missouri Botanical Garden 2010;97(4):584-616. Xiong Z, Kim JS, Pires JC. 2010. Integration of genetic, physical, and cytogenetic maps for Brassica rapa chromosome A7. Cytogenetic and Genome Research 129(1-3):190-198. Duarte JM, Wall PK, Edger PP, Landherr LL, Ma H, Pires JC, Leebens-Mack J, Depamphilis CW. 2010. Identification of shared single copy nuclear genes in Arabidopsis, Poplulus, Vitis, and Oryza and their phylogenetic utility across various taxonomic levels. BMC Evolutionary Biology 10(1):art no. 61. Gaeta RT, Pires JC. 2010. Homoeologous recombination in allopolyploids: the polyploid ratchet. New Phytologist 186(1):18-28. Decker JE, Pires JC, Conant GC, McKay SD, Heaton MP, Chen K, Cooper A, Vilkki J, Seabury CM, Caetano AR, Johnson GS, Brenneman RA, Hanotte O, Eggert LS, Wiener P, Kim JJ, Kim KS, Sonstegard TS, Van Tassell CP, Neibergs HL, McEwan JC, Brauning R, Coutinho LL, Babar ME, Wilson GA, McClure MC, Rolf MM, Kim J, Schnabel RD and Taylor JF. 2009. Resolving the evolution of extant and extinct ruminants with high-throughput phylogenomics. Proceedings of the National Academy of Sciences of the United States of America 106(44):18644-18649. Cheung F, Trick M, Drou N, Lim YP, Park JY, Kwon SJ, Kim JA, Scott R, Pires JC, Paterson AH, Town C, Bancroft I. 2009. Comparative analysis between homoeologous genome segments of Brassica napus and its progenitor species reveals extensive sequence-level divergence. Plant Cell 21(7):1912-1928. Trick M, Kwon S-J, Choi SR, Fraser F, Soumpourou E, Drou N, Wang Z, Lee SY, Yang T-J, Mun J-H, Paterson AH, Town CD, Pires JC, Pyo Lim Y, Park B-S, Bancroft I. 2009. Complexity of genome evolution by segmental rearrangement in Brassica rapa revealed by sequence-level analysis. BMC Genomics 10, art. no. 539. Wright KM, Pires JC, Madlung A. 2009. Mitotic instability in resynthesized and natural polyploids of the genus Arabidopsis (Brassicaceae). American Journal of Botany 96:1656-1664. Edger PP, Pires JC. 2009. Gene and genome duplications: The impact of dosage-sensitivity on the fate of nuclear genes. Chromosome Research 17:699-717. Gaeta RT, Yoo S-Y, Pires JC, Doerge RW, Chen ZJ, Osborn TC. 2009. Analysis of gene expression in resynthesized Brassica napus allopolyploids using arabidopsis 70mer oligo microarrays. PLoS ONE 4(3), art. no. e4760. Lim KY, Soltis DE, Soltis PS, Tate J, Matyasek R, Srubarova H, Kovarik A, Pires JC, Xiong Z, Leitch AR. 2008. Rapid chromosome evolution in recently formed polyploids in Tragopogon (Asteraceae). PLoS ONE 3(10), art. no. e3353. Pires JC, Hertweck KL. 2008. A renaissance of cytogenetics: Studies in polyploidy and chromosomal evolution. Annals of the Missouri Botanical Garden 95(2):275-28. Gaeta RT, Pires JC, Iniguez-Luy F, Leon E, Osborn TC. 2007. Genomic changes in resynthesized Brassica napus and their effect on gene expression and phenotype. Plant Cell 19(11):3403-3417. Leebens-Mack J, Vision T, Brenner E, Bowers JE, Cannon S, Clement MJ, Cunningham CW, DePamphilis C, DeSalle R, Doyle JJ, Eisen JA, Gu X, Harshman J, Jansen RK, Kellogg EA, Koonin EV, Mishler BD, Philippe H, Pires JC, Qiu Y-L, Rhee SY, Sjolander K, Soltis DE, Soltis PS, Stevenson DW, Wall K, Warnow T, Zmasek C. 2006. Taking the first steps towards a standard for reporting on phylogenies: Minimum Information about a Phylogenetic Analysis (MIAPA). OMICS A Journal of Integrative Biology 10(2):231-237. Paterson AH, Bowers JE, Estill JC, Osborn TC, Pires JC, Amasino R, Quiros CF, Farnham M. 2006. Evolutionary history of the angiosperms and its relevance to Brassica. Acta Horticulturae 706:49-53. Lukens LN, Pires JC, Leon E, Vogelzang R, Oslach L, Osborn T. 2006. Patterns of sequence loss and cytosine methylation within a population of newly resynthesized Brassica napus allopolyploids. Plant Physiology 140(1):336-348. Givnish TJ, Pires JC, Graham SW, McPherson MA, Prince LM, Patteron TB, Rai HS, Roalson EH, Evans TM, Hahn WJ, Millam RC, Meerow AW, Molvray M, Kores PJ, O'Brien HE, Hall JC, Kress WJ, Sytsma KJ. 2005. Repeated evolution of net venation and fleshy fruits among monocots in shaded habitats confirms a priori predictions: Evidence from an ndhF phylogeny. Proceedings of the Royal Society B: Biological Sciences 272(1571):1481-1490. Walling JG, Pires JC, Jackson SA. 2005. Preparation of samples for comparative studies of plant chromosomes using in situ hybridization methods. Methods in Enzymology 395:443-460. Kovarik A, Pires JC, Leitch AR, Lim KY, Sherwood AM, Matyasek R, Rocca J, Soltis DE, Soltis PS. 2005. Rapid concerted evolution of nuclear ribosomal DNA in two tragopogon allopolyploids of recent and recurrent origin. Genetics 169(2):931-944. Pires JC, IJ Maureira, TJ Givish, KJ Sytsma, G Petersen, O Seberg, C Asmussen, JI Davis, DW Stevenson, PJ Rudall, MF Fay,and MW Chase. In press. Phylogeny, genome size, and chromosome evolution of the Asparagales. IN: JT Columbus (ed. ), Monocots: Systematics and Evolution. Pires JC, J Zhao, ME Schranz, EJ Leon, PA Quijada, LN Lukens, and TC Osborn. 2004. Flowering time divergence and genomic rearrangements in resynthesized Brassica polyploids (Brassicaceae). Biological Journal of the Linnean Society 82: 675-688. Pires JC, KY Lim, A Kovarik, R Matyusek, A Boyd, AR Leitch, IJ Leitch, MD Bennett, PS Soltis, and DE Soltis. 2004. Molecular cytogenetic analysis of recently evolved Tragopogon (Asteraceae) allopolyploids reveal a karyotype that is additive of the diploid progenitors. American Journal of Botany 91: 1022-1035. Osborn TC, Pires JC, Birchler JA, Auger DL, Chen ZJ, Lee H-S, Comai L, Madlung A, Doerge RW, Colet V, Martienssen RA. 2003. Understanding mechanisms of novel gene expression in polyploids. Trends in Genetics 19: 141-147.